Built on the trusted StrikeAlert technology, StrikeAlert HD is the first personal lightning detector with a graphical display that shows you the lightning strike distance (from 0 - 40 miles away) as well as a 1-hour storm trend and intensity. This the first personal lightning detector with a graphical display that shows you the lightning strike distance (from 0 - 40 miles away) as well as a 1-hour storm trend and intensity. Ibode unique Night Vision system technology ensures clear, color video in extremely low light. 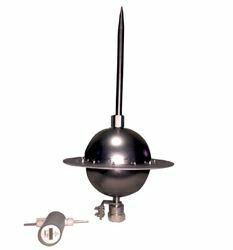 he ALPS™ LDN consists of an appropriate number of sensors (PLS™) as deemed necessary to satisfy the users requirements for lightning Detection Efficiency and Location Accuracy. It is used to detect the light. After detection, we have two choices at user end. In the first case, user is wirely interfaced with detector and in second case, user is wirelessly interfaced with the detector circuit. In include LDR, microcontroller, LCD and RF module (Only in case of wireless interface). We are engaged in trading a wide variety of products like lightning detectors. 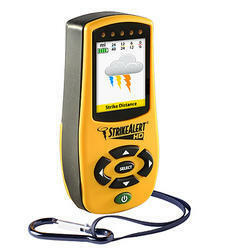 This is a new generation, patented, field-generator type storm detector for professional use. In real time, it measures variations in the electrostatic field of the atmospheric layer close to the ground, thus revealing any changes that may indicate an imminent storm with a risk of lightning strike in the vicinity.